Michigan State University Press, 9781611861211, 172pp. Though creative nonfiction has been around since Montaigne, St. Augustine, and Seneca, we’ve only just begun to ask how this genre works, why it functions the way it does, and where its borders reside. But for each question we ask, another five or ten questions roil to the surface. And each of these questions, it seems, requires a more convoluted series of answers. What’s more, the questions students of creative nonfiction are drawn to during class discussions, the ones they argue the longest and loudest, are the same ideas debated by their professors in the hallways and at the corner bar. 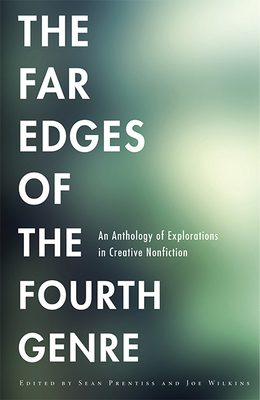 In this collection, sixteen essential contemporary creative nonfiction writers reflect on whatever far, dark edge of the genre they find themselves most drawn to. The result is this fascinating anthology that wonders at the historical and contemporary borderlands between fiction and nonfiction; the illusion of time on the page; the mythology of memory; poetry, process, and the use of received forms; the impact of technology on our writerly lives; immersive research and the power of witness; a chronology and collage; and what we write and why we write. Sean Prentiss is Assistant Professor at Norwich University. He has had essays, poems, and stories published in Brevity, Sycamore Review, Passages North, ISLE, Ascent, River Styx, Spoon River, Nimrod, and many other journals. Joe Wilkins is Associate Professor of English at Linfield College, and is the author of a memoir, The Mountain and the Fathers: Growing Up on the Big Dry, and two collections of poems, Killing the Murnion Dogs and Notes from the Journey Westward. Prentiss and Wilkins have collected a strong and engaging group of writers to not only examine the form and function of the twenty-first century essay but also to contemplate how the essayist attempts to reconcile the layered realities of what’s real, what’s remembered, and what’s online. Here is an essay collection with edge. Prentiss and Wilkins have gathered together some of the freshest voices and brightest stars in contemporary nonfiction writing for this anthology on process and practice. The anthology will be especially useful to teachers of creative writing who are looking for succinct, spot-on essays about the craft of writing nonfiction. Each essay offers the reader some new avenue or technique in nonfiction writing to chew on, to ruminate over, and to be emboldened by for future incorporation into one’s own creative work.